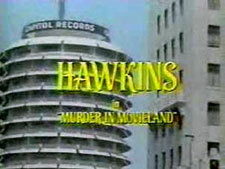 Hawkins: Mystery and Suspense on Television. Jimmy Stewart stars as attorney Billy Hawkins in this series that aired (with Shaft) as part of The New CBS Tuesday Night Movies. Though Stewart won a Golden Globe Award for his performance, the series was canceled (as was Shaft) after one season of 7 episodes.